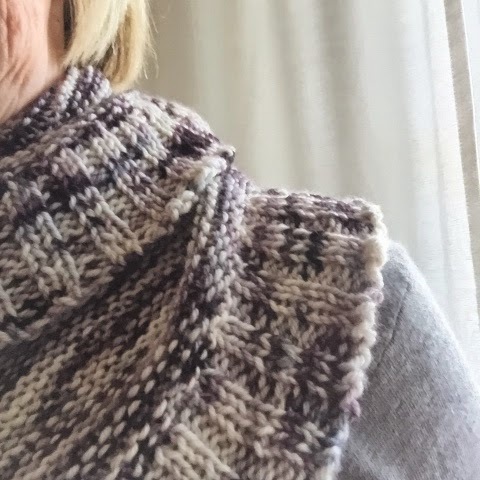 When I saw this pattern on Susan B. Anderson's Instagram feed I knew I wanted to try making it. I have known how to knit since I was a teen but have had a love hate relationship with the whole process until I discovered knitting socks 18 months ago. 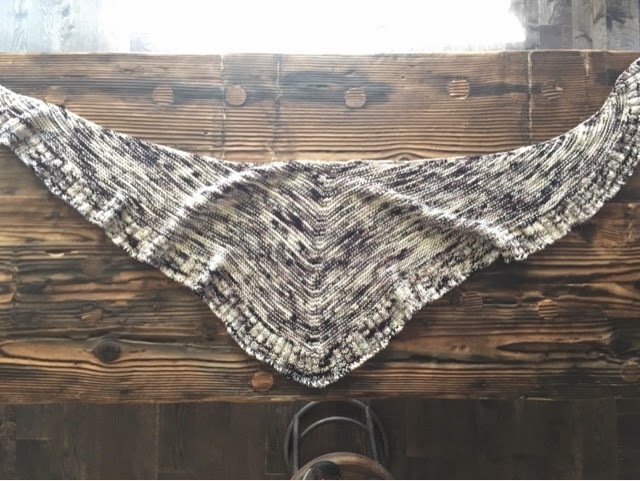 Last month I decided to change it up and try making a shawl. 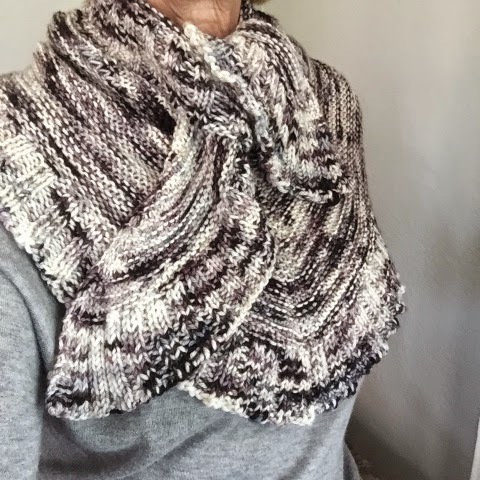 This pattern is so easy and looks so good. It's big and squishy and oh, so soft. 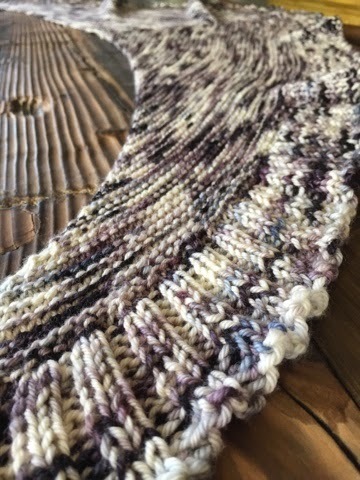 The Yowza yarn was a dream to work with. This shawl is big. It measures 80" from end to end and is 20" at the point. 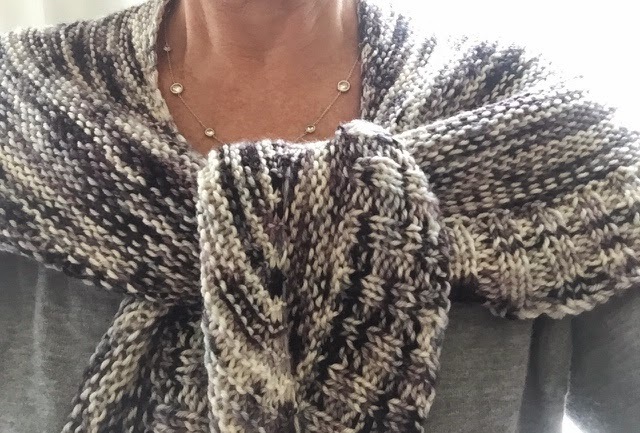 It's big enough to cover my shoulders as a shawl and if I wrap it around my neck it will keep me toasty warm. I just hope I get some cold weather so I can wear it in Chicago next week. Otherwise it gets packed away with moth sachets for 6 months. The entire shawl, except the ribbing portion is knit in garter stitch, so it knits up quickly. I think it looks like a giant moth in this photo. One thing I am pretty proud of is that I finally learned how to knit and purl continental style. That means I don't throw the yarn anymore. My stitches are looser but the whole process is easier on my hands not to mention learning a new technique is good for the brain cells. I've noticed that with all the sewing and knitting I am doing I have Repetitive Motion Pain in my shoulders and wrists. 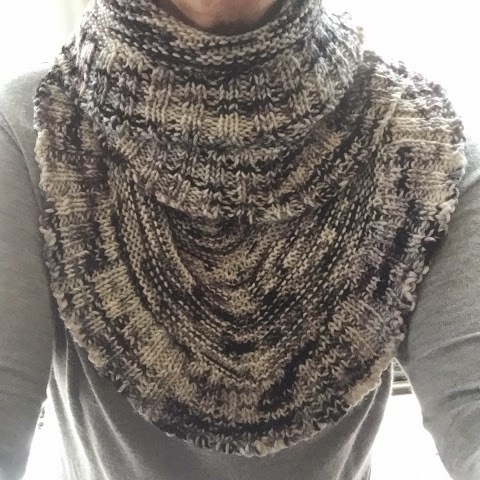 I really like this shawl and think I will make another one in another colorway. It's beautiful! I hope you get to wear it, and I guess even your evenings are not cool enough to need something over your shoulders in summer? What a place you live. That's beautiful! Weirdly, I have only knitted socks the last 6 months but bought yarn and a pattern for a shawl last week. I hope it turns out as nice as yours! I wouldn't have known that was Morticia it looks like Ansel... so pretty. I adore Miss Babs... when they were here for Stitches West I spent enough in her booth to buy a spinning wheel. Instead I got a couple huge bags of yarn... haha.